The Boone County Distilling Company has been producing premium bourbon for just a year. Reviving a distilling history in northern Kentucky with deep roots in producing quality spirits in the 1800s. Boone County Distilling Company pays homage in resurrecting the culture, pride and determination of these early distilling pioneers-and in producing products, such as the Company’s signature ten-year old bourbon, Eighteen33. Countless bourbon lovers in the region have requested the opportunity to tour the Boone County distillery and learn more about the origins of the original Distillery, founded by William Snyder 183 years ago. The distillery grew into the largest in Kentucky in the late 1800s. Starting on October 22, 2016, visitors will be able to tour the 5,000 square foot still house, 800-barrel rick house, and tasting room/gift shop. The walls have been adorned with the original stories and historical photos dating back to the distillery’s 1833 inception. The consumer path of the distillery was designed under the guidance of Mrs. Peggy Noe Stevens, kin of the late Booker Noe of the legendary Jim Beam Distillery. 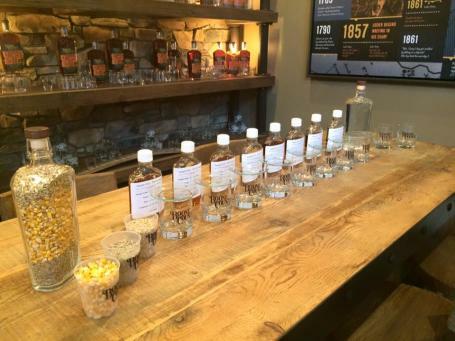 The visitor experience at Boone County is designed to be as authentic as the bourbon itself. The company engaged the brand vision of noted Kentucky creative Keith Neltner, and his Neltner Small Batch brand team, to build an engaging consumer retrospective into the bourbon-making history of the region. Neltner worked closely with Geograph Industries of Harrison, Ohio, to complete the fabrication of the displays. You’ll find Boone County’s distillery, tasting room, and gift shop at 10601 Toebben Drive in Boone County, Kentucky. For distillery hours of operation and tour schedule, visit madebyghosts.com. Click here to see the impact of tourism in Cincinnati USA.